As the senior global sustainability advisor for Maersk Line—both a major buyer with a large supply chain and a leading supplier to global brands—Mette Olsen oversees both sides of the procurement process. Following our recent BSR Connect event in Copenhagen, we asked Olsen to tell us more about her perspectives on advancing sustainable procurement. At our event, you suggested that buyers and suppliers needs to collaborate more to advance sustainable procurement. What is your vision? Having advised large, business-to-business companies on sustainability issues for quite some time now, I have had a chance to work on sustainability initiatives both upstream and downstream in the value chain. Personally, I think part of the challenge with “sustainable procurement” as a distinct discipline is that it has historically been biased toward the procurement side of things. As a result, much of the discourse and tools we currently deploy in this field cater mostly to the buyer perspective and less so to the supplier perspective. I would personally like to see a paradigm shift where buyers and suppliers in various aspects of the value chain collaborate with each other to solve material sustainability challenges in a way that is meaningful both. Maersk Line is, on the one hand, an important customer demanding responsible practices from suppliers, and, on the other hand, a supplier to major global brands that ask you to meet their requirements. What does this mean for your business? Overall, I think Maersk Line is a good example of a company that is in a perfect position to exert a positive influence both up and downstream in the value chain. That said, I think it is fair to say that we have not cracked the code on sustainable procurement yet, either from a buyer or a supplier perspective. Today, approximately 21 percent of our customers by volume require tailored sustainability information from us through codes of conduct, questionnaires, carbon-emissions data, audits, and more. However, even though our customers include some of the world’s biggest and most sustainable brands, our challenge remains getting beyond these “compliance-focused” discussions to a place where our sustainability efforts are truly incorporated into our customers’ decision-making processes. 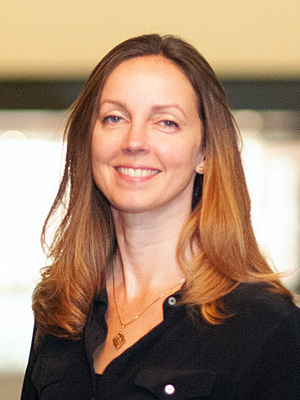 On the other hand, we, too, are committed to advancing sustainability and responsible business practices in our supply chain and, like our customers, we are looking for meaningful ways in which we can engage our more than 25,000 suppliers on this topic, while constantly balancing these efforts against “conventional” procurement criteria such as cost, quality, and flexibility. So it’s a bit of a catch-22. Could you outline the different drivers for buyers and suppliers, and where you see the opportunities for collaboration? There is fundamental divide between what we as customers want from our suppliers and what we, conversely, want from our customers as their suppliers. 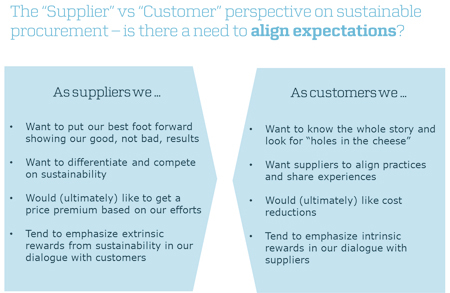 Interestingly, these divided expectations can play out at the same time within a company, where you can have the sales function frustrated that customers do not value sustainability in the procurement process, and where you can have the procurement function—or, more likely, the sustainability function—imposing new requirements on suppliers while stating that this should not have any commercial implications or drive up costs. As buyers, we like to say things like “good sustainability performance should not come as an added cost,” but as suppliers we like to see our efforts rewarded and incentivized in the marketplace, whether we are selling to other businesses or directly to consumers. On a practical level, what are the mechanisms in place that companies can use to ensure better integration of the buyer and supplier points of view? Do you have any examples of companies or initiatives that are doing this well? I think collaboration between buyers and suppliers is key to promoting true progress on sustainability in the value chain. We need the buyer and supplier perspectives to work together on solving concrete sustainability challenges and to ensure that the right incentives are in place for all parties. I think Unilever’s efforts to include their strategic suppliers in reaching the targets set out in the Sustainable Living Plan shows some of the right thinking, enabling suppliers to go “beyond compliance” and giving them a chance to demonstrate how their services can help a key customer improve its sustainability performance. I also think the Clean Cargo Working Group, which is facilitated by BSR and of which Maersk Line is a member, is a good example. What I really like about this group is that you have both shippers (the buyers) and ocean carriers (the suppliers) working together on creating transparency around the environmental impacts of shipping. As a result, the group has produced some very tangible tools that help the ocean carriers benchmark and improve their sustainability performance, and also enable the shippers to make better and more informed decisions, also on sustainability.